Mary was astonished to see the stone rolled away. She had come expecting to find the corpse of Jesus, and now she was disappointed. Who had taken him away? What cruel prank was this? She told the disciples, and Peter and John were bold enough to risk capture by going to the tomb. They looked closer, but returned home, although John recorded that what he saw made him believe something else had occurred. 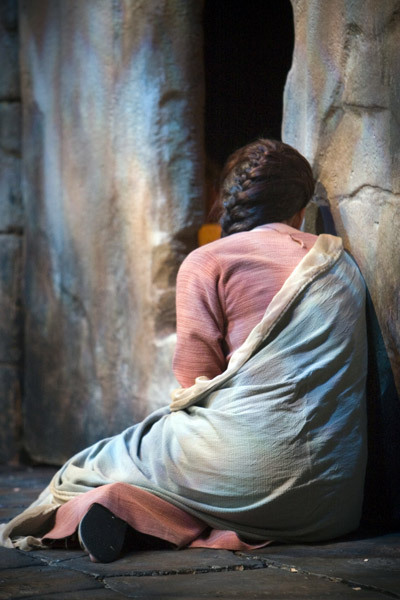 Mary was still bewildered, and stood outside the tomb sobbing and wailing uncontrollably. Where had they taken his body? She saw someone standing there, and peering closely, concluded it was just a laborer, probably the gardener. Had her faculties of sight altered? Was her sight obscured by all her tears? No, Jesus had changed, for He had been resurrected! The means of knowing Jesus had changed as well! Only through Him speaking to her did Mary know Him, and so we find the truth of divine revelation. We can search for God all we want, but we will never, never find Him if we are seeking to know Him in the flesh. When Mary rushed to hug Jesus, He said, “do not touch me.” He had truly changed, and there was to be a new way of knowing Him, a way which transcends the senses, a way which transforms our lives. Mary wept. Seeking a corpse, she mistook Jesus for a common person. Many of us mistake Jesus as someone common, not the life-changing Son of God that He actually is. We all have things that we cry over, struggle with or feel stressed about. We may reach a deadlock, a dead-end, and feel as if there is no possible way out. Only when we reach the end of our fleshly strength will we be ready to listen to His voice. When you realize that you need God, need to know His resurrection power, be quiet, for you are likely to hear Him calling you. You can search for Him with all your might, but He can never be found in the strength of your flesh. He has changed! He has risen. He is known only in the Spirit now, and your flesh wars with the Spirit. Christ “after the flesh” was crucified. Knowing Him in that way results in a corpse vainly searching for another corpse. Mary searched in her flesh and knew not the Resurrected Christ. When her tears were drained, and she was at the end of herself, she was ready to hear His voice. Are you still relying on your own strength and abilities? Are you seeking to know Jesus after the flesh? Give it up, lay aside who you think He is, humble yourself before Him, and ask to hear His voice. Only when you give up on the flesh is the Spirit ready to take over. And the Spirit delights in making Jesus Christ known to your heart! I’m curious who the artist is of this beautiful picture of Mary at the tomb. The style is very familiar to me, almost like an Arthur Rackham, but I can’t quite place it. Also, how on earth did you get a copyright on the piece? Are You Being a Noah to Your World?